Despite Protection Efforts, Rhino Poaching Soars : The Two-Way Nearly 600 rhinos have been killed this year despite extensive efforts by South Africa and other African nations to protect the animal. Miles Lappeman (left) and his son Marc with the carcass of a rhino that was killed for its horn at their Finfoot Lake Reserve on Nov. 24 in South Africa. This was one of eight rhinos slaughtered by poachers. Just a few years ago, rhino poaching appeared to be more or less under control. Shootings were relatively rare, and about 75 percent of the world's rhinos lived in South Africa, a country that has taken extensive efforts to protect them. Just 13 rhinos were reported killed worldwide in 2007. But the figure has been surging in recent years and has already hit 588 so far this year, according to conservation groups. An estimated 25,000 rhinos remain in Africa. The rhino horn market has created a network of armed gangs. Helicopters, night vision gear, and silenced rifles are used by poachers to wound or kill rhinos, which are often sedated with drugs acquired from veterinarians who have been bribed, reports The Guardian. Chain saws are used to saw off the rhino's horns, many times while they are still alive. The primary destination for the horns is Asia. In Vietnam, for example, rhino horns sell as if they were cocaine. The horns have become a "drug" of choice for wealthy Vietnamese buyers who often grind and snort the powder, believing it improves sexual performance, wards off or cures cancer and relieves hangovers. The South African government has deployed soldiers to help protect the animals and drones that attempt to track and monitor poachers. Security contractors that worked in Iraq and Afghanistan are being hired privately. 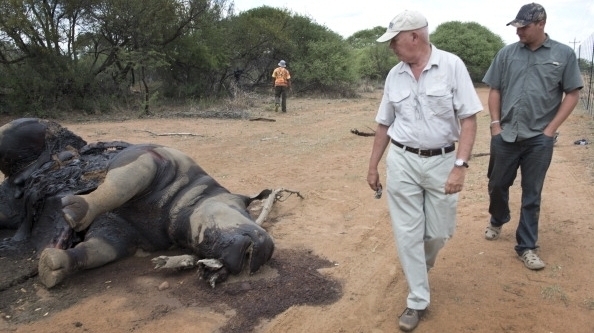 Some game parks cut off the rhino horns to make them worthless to poachers. Others spray pesticide on the horns to give them a bright stain, detracting from their value. Just a 90-minute drive from cosmopolitan Johannesburg, there is a raging bush war going on between poachers and workers at the Finfoot Lake Reserve. This month, eight rhinos were killed at Finfoot. Before one rhino mother died, she somehow managed to walk to the boundary of the reserve. "She had physically come to the road to die, to say, 'I'm dying, come fetch my calf,' " Marc Lappeman, who runs the reserve with his father, Miles, told The Associated Press. The Lappemans arm themselves to defend their rhinos, which they personally breed. "We are willing to die for these animals," he said.